I’m not really an animal person, but I used to like Pokemon a lot. It satisfied a deeply rooted urge to collect that few games do. My love of Pokemon has mostly subsided, but now I have a new obsession: Pocket Frogs! This little app is totally free and about as addictive as breathing. You basically just collect and breed frogs. Much more casual than Pokemon, Pocket Frogs is the kind of 5-minute distraction that you may find eating up hours of your time. You start off with just a couple of fairly ordinary, plain-Jane frogs in a habitat. Frogs start off wild, but you can tame them by taking them to the pond and having them gorge on dragonflies until they warm to you. To get around the pond, all you have to do is tap an available lily pad and the frog will jump to it, hopefully snagging a dragonfly or two along the way. Sometimes lily pads even have presents sitting on them, either extra coins or special items that can be delivered to your mailbox. 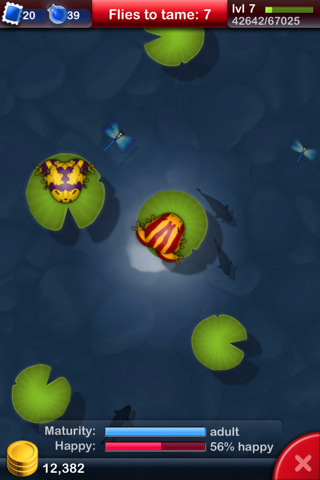 Special items can be rare frogs or scenery items to dress up your habitats and make your frogs happier. Tame frogs come with couple of different benefits, the biggest one being the ability to breed them. Once a frog is tame and mature, you can choose to breed it in your habitat or with wild frogs you encounter at the pond, and an egg will be placed in the nursery. Oddly, it never shows the actual life cycle of the frog. The eggs just grow until they spit out a tiny frog, at which point, you can choose to move the new frog into one of the regular habitats. To make the experience more of a game, Pocket Frogs gives you tons of achievements to shoot for, most of them related to collecting specific types of frogs. To assist you with those goals, you can sell and buy frogs from the store, or even trade them with friends and neighbors. The social aspect feels a little awkward, since it requires a Plus+ account to participate. I’m hoping that the developers will get on board with the Apple Game Center very soon, but it’s a minor flaw. There are a couple of more major issues with the game though. The first is the lack of tutorial or help; seriously, the help button goes nowhere. It’s not difficult to pick up, but you are stuck with a lot of bewildering trial and error at first. Second, you can catalog tame frogs, but only up to 50 at a time. With hundreds of different frogs out there, you want a place to show all the different kinds you’ve found, not just a handful of them. This might just be my “Gotta catch ’em all” attitude talking, but not being able to document all of the frogs I encountered really rubbed me the wrong way. Still, I have to admit, I’ve been stuck to this app like glue. Pocket Frogs totally scratches my itch for mindless entertainment in a way that Farmville or Farm Story never have, and based on the sheer number of downloads since its release, I know I’m not alone. Pocket Frogs is a universal app so you get an iPad version as well when you buy the iPhone app. AppSafari review of Pocket Frogs was written by Tracy Yonemoto on October 13th, 2010 and categorized under Action, App Store, Free, Fun, Games, iPad apps, Multiplayer, Resource Management, Universal. Page viewed 6829 times, 2 so far today. Need help on using these apps? Please read the Help Page. i love this game! it is very addicting and i have sat there and played it for 2 or 3 hours straight a couple of times haha…anyways i love this game! This is a great little game and the review is good, except for “not being able to document all of the frogs I encountered”. 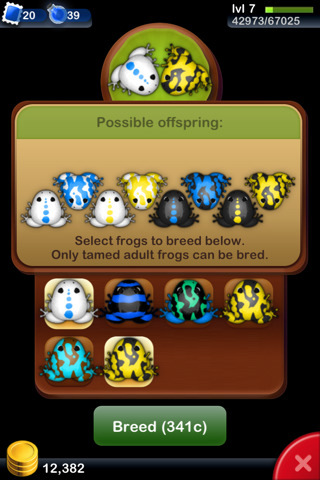 There is a froggydex in the game that not only shows you all of the frogs that you’ve bred, but also all of the possible frogs. This review was based on an earlier edition that did not include the Froggydex or Game Center integration, but these are both very welcome additions. What does the red alerts button mean on pocket frogs?? Ruth: It’s used to give you a message when your frog hatches or matures, even if you don’t have the App open. We love this game but thier needs to be new frogs on levels 17 and higher. So im asking for you guys to have more level frogs. PF is awesome! its one of those games u never get tired of, its one of the best games ever and its FREE!